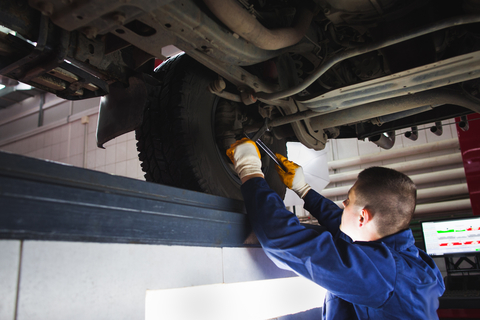 Your vehicle’s suspension system is what’s responsible for ensuring you have a smooth ride. While most drivers understand the basics of the suspension system (it absorbs bumps), not everyone knows some of the more intricate details. Read on for Park Muffler’s guide to your suspension system. Tires – Having properly inflated tires can go a long way in helping smooth out your ride and take some of the pressure off of the rest of the system. Shock absorbers – Essentially working as a hydraulic pump, shock absorbers work in conjunction with the springs to absorb and disperse kinetic energy. Unlike struts, shocks offer no structural support and instead help to prevent the springs from bouncing indefinitely. Struts – Unlike shocks, struts act as a major structural component of the vehicle. They hold the wheels in place and support the spring. They function very similarly to a shock absorber, with a piston moving to redisperse the kinetic energy of driving on a bumpy road. Springs – Springs absorb road impacts, support the weight of the vehicle, and keep all four wheels on the road. They absorb the shock of bumps in the road by compressing accordingly. Additionally, springs provide structural support and prevent the body from sitting too low (thus preventing damage to both the body and frame). All of the various components of your vehicle’s suspension system work together in order to absorb bumps in the road. When you drive over a bumpy road, the suspension system absorbs and disperses the energy. Shocks and struts both work with the spring in order to balance out the force and prevent the springs from bouncing indefinitely. Typically new cars have what’s known as independent suspension, where each wheel is able to travel up and down without bringing the other wheels along with it. The isolated road response increases smoothness by allowing each wheel to adapt to uneven surfaces accordingly. Suspension plays a key role in ensuring you have an enjoyable drive. Not only that, but it protects other crucial vehicle components from being damaged when driving over rough terrain. Ensure that your suspension is in top working condition. Book an appointment with Park Muffler today.